If I had a nickel for every time I was munching on a piece of seaweed and thought, “This would be better if it tasted like the bacon of the sea,” I would have zero nickels. But because people love all things that taste like that savory pork product, of course a group of scientists have figured out how to make seaweed-flavored bacon. Scientists at Oregon University say a new strain of seaweed they’ve recently patented grows quickly, is packed with protein and contains twice the nutritional value of kale, and most importantly, it tastes like bacon, reports the Associated Press. An edible form of seaweed called dulse that grows wild along the Pacific and Atlantic coastlines is already harvested and commonly used in dried form by people as either an addition to recipes or as a nutritional supplement. 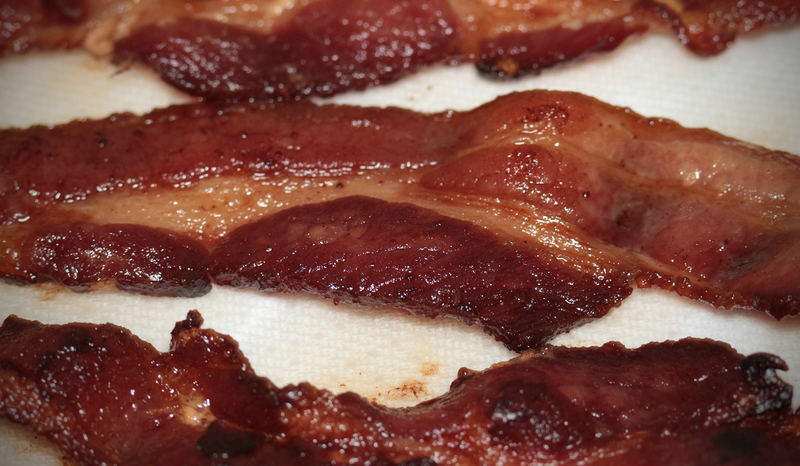 OSU researchers say their bacon variety can be farmed and eaten fresh. Otherwise it’d sort of be bacon seaweed jerky. This was no overnight success story, either: scientists have been slaving away in underground labs with secret entrances on this formulation for years (only the last part of that sentence is true) to come up with a superfood that could be fed to commercially grown abalone. The new dulse creation looks like translucent red lettuce, and contains many minerals, vitamins and antioxidants, along with protein, scientists say. Abalone grew super quickly when fed the dulse, with an abalone operation in Hawaii already using it on a commercial scale. Heck — abalone are great and all, but what about us hungry humans? We need more bacon, figured a product development team at the university’s Food Innovation Center, who created new foods made with dulse. Besides bacon-tasting strips — which are fried like regular bacon — there’s a dulse-based rice cracker and salad dressing. A culinary research chef has also joined the team to further refine recipes and products, while several chefs in Portland are testing the new sea “vegetable” in their recipes. Meanwhile, SpongeBob Squarepants is probably doing little happy bacon dances somewhere under the sea. *Thanks for the tip, @_parv! Next CFPB Launches Monthly Reports To Showcase Financial Difficulties In Specific Areas Of The U.S.
Next Up: CFPB Launches Monthly Reports To Showcase Financial Difficulties In Specific Areas Of The U.S.